The saying, “anybody can cook an egg” might be one of the biggest exaggerations ever uttered in a dining room. When you think about it, brunch is a one-off, a menu — wholly separate and distinct from other menus — that is used for just four hours a week. And while it might seem like a loathsome chore for a restaurant crew to rise early and prep for weekend brunch, especially after kicking out its last customers only hours earlier, many operators have led the evolution of the meal from a stuffy weekend affair to an elevated and diversified experience. As a result, if you haven’t noticed, brunch is a damn near essential slot in the weekly calendar these days, and hoo boy does Cleveland agree. With Scene’s annual United We Brunch event this weekend (Saturday, April 6, at the Madison; tickets and info at scenebrunch.com), it’s also time for our annual look at the best and brightest on the brunch landscape, because Cleveland really enjoys an embarrassment of riches and options you should be exploring the rest of the year. What began as a diminutive Latin-themed cafe dispensing crisp, corny arepas has developed into an ambitious, wide-ranging and spirited restaurant on both sides of town. Given the eatery’s propensity to broaden our culinary horizons, it’s no surprise that weekend brunches come with a side of discovery. On weekends here you’ll get to know — and love — cachapas, Venezuelan-style sweet corn pancakes stuffed with cheese, braised beef or bacon and eggs. The brunch menu also offers build-your-own egg plates with Colombian sides like rice and beans, crunchy tostones, or soft, sweet plantains. Wait, that clock can’t be right. You mean to tell me that we’ve been rolling clear through till sunrise? Birds don’t lie, bro. Birds don’t lie. If you can somehow manage to make it to 10:30 a.m., you’re golden, because that’s when the South Side in Tremont starts pouring its legendary Bloody Marys (including the overstuffed Mother Mary, a one-stop drink/meal stuffed and skewered with everything but the kitchen sink) and dishing out its heavenly chicken and waffles. Of course, when it comes to mopping up last night’s mess, nothing does the job better than fresh-baked buttermilk biscuits buried beneath creamy sausage gravy. Also on tap: bennies, enchiladas, frittatas and more. Brewnuts might not technically “serve brunch,” but they do sell donuts and coffee, which is about as close to the ideal breakfast as one can get. This Detroit-Shoreway donut bar serves up delicious drip and espresso-based coffees from local legend Phoenix Coffee. You can also tuck into a hot cocoa or a soothing hot toddy to pair with your mocha-glazed fry cake, salted caramel donut with pecans, or rum-soaked pina colada confection. Ah, who are we kidding? Skip the java and knock back a few pints of a local IPA and call it a morning. Vegans love brunch too, we assume. Good thing for them there’s Cleveland Vegan, a pioneer in the meat-free dining scene. Saying “no” to bacon, sausage, ham, scrapple … (sorry, we got carried away) has never been easier thanks to this Lakewood eatery, where guests enjoy a savory three-course breakfast for around $20. Start with a bagel and a schmear before moving on to avocado toast or cheesy mashed potato cakes. Cap it all off with housemade biscuits with pepper gravy or a creative shiitake Benedict. To drink, there’s coffee, tea and fresh fruit smoothies. Perennial Best of Cleveland “Best Brunch” winner, Lucky’s Cafe cleans up annually thanks in large part to chef Heather Haviland’s heavenly cheddar-scallion biscuits with scrambled eggs and sausage gravy, a category killer if ever there was one. Bleary-eyed diners also flock to this Tremont coffee house for honey-coated granola, gingerbread waffles topped with maple-roasted apples, breakfast burritos stuffed with scrambled eggs, and the ever-famous Shipwreck, a dizzying mish-mosh of eggs, hash browns, bacon and cheddar. 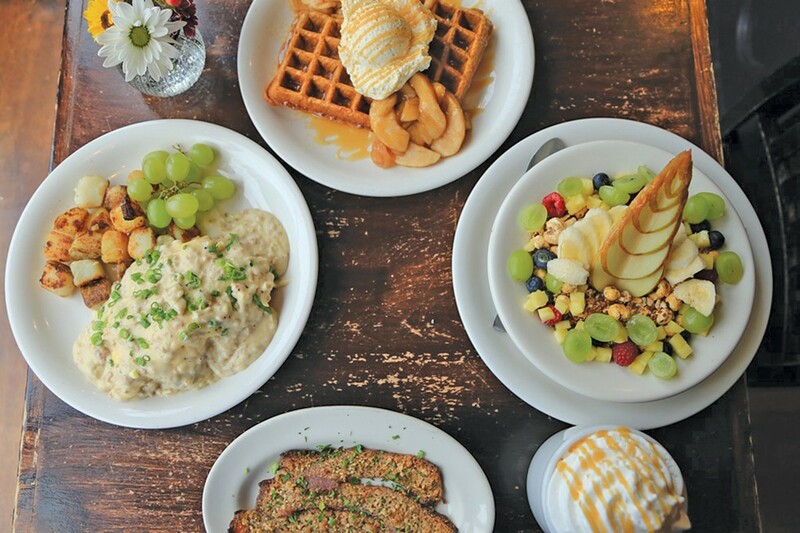 Hit up Lucky’s during the week for the same great food; there’s no rule that says brunch can only happen on weekends. This little French-inspired spot is an Ohio City jewel, a hidden lair with a locals-only vibe that truly is “easy like Sunday morning.” Kickstart your day with a frothy cappuccino — or a glass of champagne — and peruse the European influenced menu. Crepes, like the ham and d’Affinois, are always a great idea, but so too are fluffy omelets, sunny quiches and tangy lemon curd French toast. If you’re feeling more “unch” than “br,” dig into a salad Nicoise with salmon, egg, potato and olives or the roast chicken sandwich, an airy croissant layered with meat, goat cheese and mango chutney. You won’t find a more decadent, high-end brunch spread than Crop’s, which is an all-you-can-eat waistband-expanding endeavor. On Saturdays and Sundays, Crop rolls out a buffet with a carving station for house-roasted prime rib and ham. There are omelets stuffed and folded to order at an omelet station, with choices including crab, shrimp, lobster, meat and a variety of veggies and cheeses. A chilled seafood section is festooned with shrimp cocktail, snow crab, mussels, crawfish salad, and lobster salad. More? Surely. A dozen different hot dishes will satisfy all the major food groups, including eggs, bacon, maple sausage, waffles, pancakes and more. A cold antipasto section will be outfitted with domestic and imported cheeses, charcuterie, smoked fish, fresh fruits and vegetables, and salads. A bread station is stocked with breads, pastries and accompaniments. There’s a dessert station, too, folks. Adults are $39, children ages 5 to 12 are $20. Big Al’s doesn’t do brunch. It does breakfast all day. No booze. No flowers. No frippery. But whatever you call it, the results are the same: heart-warming plates of diner-style fare that are guaranteed to set you right. Folks go gaga over the satellite dish-size pancakes, but we can’t seem to pry ourselves away from the biscuits and gravy, a pair of multilayered dough cakes drowning in sausage-studded gravy, gilded with a pair of over-easy eggs, and sided by a mountain of onion-laced hash browns. Our No. 2 fave is the corned beef hash, with sauteed potatoes and peppers, also topped with a pair of huevos. A makeover has given this classic Larchmere spot a fresh new look. This so-called “fine-casual” arrangement satisfies our desire for unfussy efficiency without stooping to the level of steam-table chow. Sure, guests order and pay at the counter, help themselves to condiments, and seat themselves, but the food on the other end of that transaction is every bit as good as that found in a traditional sit-down cafe. Also included in the bargain are alcoholic beverages, well-composed plates, real tableware and utensils, and an attractive dining room in which to enjoy them. During brunch, find Landmark’s outstanding Montreal smoked brisket in hashes and latkes, diner-style breakfasts, burritos, and satisfying rice bowls with options of chicken and salmon. Brunch in Cleveland — heck, brunch anywhere — used to be an exercise in muted creativity. How many different dishes can we create from a pantry of four ingredients: bacon, eggs, potatoes and bread. A Bloody Mary does not count as an ingredient, despite its ubiquity. But then something magical happened: Chefs who couldn’t be bothered with the traditional began jumping in with two feet. Chefs like Mike Nowak, who works the sweet-and-savory balance beam like an Olympic gold medalist. While still relaxed in terms of atmosphere, Black Pig’s weekend brunch offers a level of competence not found at the corner diner. Not only do guests enjoy the benefit of a professional kitchen, but also the service staff that supports it. Come for the short rib hash with eggs and black garlic aioli, or the Black Pig Benedict, with pate-topped English muffin, eggs and Hollandaise, but stay for the relaxed efficiency of a well-run brunch. Most folks breeze right by this cafe en route to the main event — shoppng at the West Side Market —but that’s foolish. For starters, there are Bloody Marys inside waiting for you. And second, the food is always reliable, consistent and affordable. One thin Lincoln nets a diner a square breakfast of two eggs any style, home fries and toast. For a couple bucks more a shopper can grab the eggs Benedict or huevos rancheros, a Latin stack of tortillas, refried beans, fried eggs, queso fresco and ranchero sauce. If you’re in a hurry to head into the market, order the fried egg sandwich to go, a soft roll stuffed with a fried egg, spicy bacon and cheese. The doors open bright and early for those in search of the worm. Qualities like a thin-but-not-too-thin crust, subtly sweet sauce, edge-to-edge cheese, and square-cut round pie combine to form Ohio-style pie, christened and now being dished up by the Ohio Pie Co. in Brunswick. Leftover pizza for breakfast is a trusty weekend remedy, but why settle for day-old when you can nab fresh pie early Saturday and Sunday mornings designed specifically for the occasion. Weekend mornings usher in a roster of brunch pies starring toppings like bacon, egg and potato on an everything-bagel-seasoning-style crust with a cream cheese white sauce. You know and love this east-side concert club for its unbridled devotion to hosting the world’s best musicians, but did you know that they also make a mean chilaquile? The come-as-you-are vibe and the live DJ combine to make this “rockin’ brunch” one of the illest, chillest in town. Start with a kicky chapula cocktail, a South-of-the-border eye-opener of tequila, orange juice and sour cherry; a fired-up coffee drink; or any one of six different takes on the Bloody Mary. Those chilaquiles consist of crunchy tortilla chips topped with chicken (or beans), over-easy eggs and queso fresco. A 180-degree departure from those are the potato latkes with lox and applesauce. People rightly adore the fried chicken and waffles, buttermilk biscuits and sausage gravy, and the sturdy corned beef hash and eggs. They could just as easily call this place Urbane Farmer, a cosmopolitan setting inside the recently revamped Westin Downtown that happens to be a lovely place to spend a few hours on the weekend. Slightly high-end to be sure, this farm-to-table concept nails everything from pricey steak dinners to satisfying egg breakfasts — which is why the steak and eggs makes perfect sense. This version pairs farm-fresh eggs with grilled flat-iron steak, sausage gravy and breakfast potatoes for an over-the-top feast. The eggs Benedict features local heritage-breed ham, house-baked English muffins and (why doesn’t everybody do this?) swaps the hollandaise sauce for bearnaise. Since Spice Kitchen was built on the practice of making the absolute most of local resources, it’s only natural that the menu thrives on the timeliest of options. And Sunday brunch is no different than the rest of the week at this Detroit-Shoreway gem. You’ll find winter greens during winter, and spring veggies when the calendar turns, and so on. Locally sourced chicken finds a home in a tasty fried sandwich version or as one half of the ubiquitous chicken and waffle offering which, while common enough elsewhere, is elevated to heavenly status by Spice’s crew. House-smoked salmon is paired with a Cleveland Bagel bagel, waffles are aplenty, and the dynamite pastry program translates to some of the best biscuits you’ll ever sink your teeth into. Since 1972, hippies with the munchies have been beating feet to Tommy’s for wholesome fare that runs the gamut from Middle Eastern falafel to Middle American tuna salad. In the a.m. it’s all about the pancakes, waffles, French toast, omelets and “breakfast creations” that range from humdrum to downright wacky. The Crudley, por ejemplo, consists of scrambled eggs, ham, tomatoes, mushrooms, onions, green peppers and cheese, while the Elsie is a triple-decker sandwich saddled with two fried eggs, bacon, cheese, peanut butter (what?!) and mayo. Be sure to tack on an order of hash browns and an old-fashioned milkshake, the breakfast beverage of winners. How could you not just snuggle into a dish called Nest Egg? This lovable item features a sunny-side-up egg nestled into a double slice of semolina toast fused together with cheddar cheese and sided by pico de gallo. Also available at this elegant bakery/cafe are healthy starts like steel-cut oatmeal with honey and fresh fruit, homemade granola with berries and Greek yogurt, and avocado toast sprinkled with sea salt and pink peppercorns. More robust appetites likely will gravitate to the breakfast burrito rolled around scrambled eggs, cheddar, black beans and silky avocado cream, or the always delightful Black Forest ham, egg and Swiss crepe. On your way out, pick up some French macarons, tarts, brownies and cupcakes to go. You can’t mention brunch in this town without bringing up Fire, an ageless American bistro on Shaker Square. The stylish yet industrial dining room with views onto the square is a charming place to ease into the day, aided by warm service and pitch-perfect food. The sticky buns here are the bomb, appearing on almost every table. Chef Doug Katz might have single-handedly launched the local shakshuka craze, with farm-fresh eggs poached in a harissa-scented tomato sauce. Fire’s eggs Benny is textbook, its shrimp and grits a revelation, and don’t get us started on those weightless lemon souffle pancakes. Sunday brunch at Astoria is every bit as pleasant as lunch on Tuesday and dinner on Thursday. Given the cafe and market’s Mediterranean bent, it’s no surprise to see the menu populated with items like Tortilla Espanola, the frittata-like pie fortified with potato and onion. Here, it’s capped with a poached egg and hollandaise sauce because, why not? I’ve been absolutely obsessed with the gyro omelet ever since typing those two words, and I’m pretty certain that the duck confit hash and eggs is in my immediate future. If you haven’t yet popped into this sunny spot, we recommend you remedy that forthwith. If you don’t think of Pier W when you think of brunch, you’re doing it wrong. Despite being precariously perched on a precipice overlooking Lake Erie, this Lakewood landmark has survived for more than 50 years, thanks to spotless seafood, professional service and those dramatic views. Sunday’s grand brunch buffet is old-school-meets-new, with sparkling raw bar selections like shrimp and oysters joining poached Atlantic salmon and smoked salmon with all the accoutrements. A carving station turns out thin-sliced roast sirloin — with horseradish cream and au jus, of course — and staples like eggs Benedict, breakfast meats, and green and fresh-fruit salads are on hand and plentiful. Weekend brunch is the ultimate relaxation, and no one knows how to take a load off quite like the coastal Europeans of Spain, Italy, Greece and France. Adega’s modern Mediterranean cuisine taps into that leisurely vibe with dishes like iberico Benedicts, lamb burgers, veal cutlet breakfast sammies and Spanish chorizo croque madames. 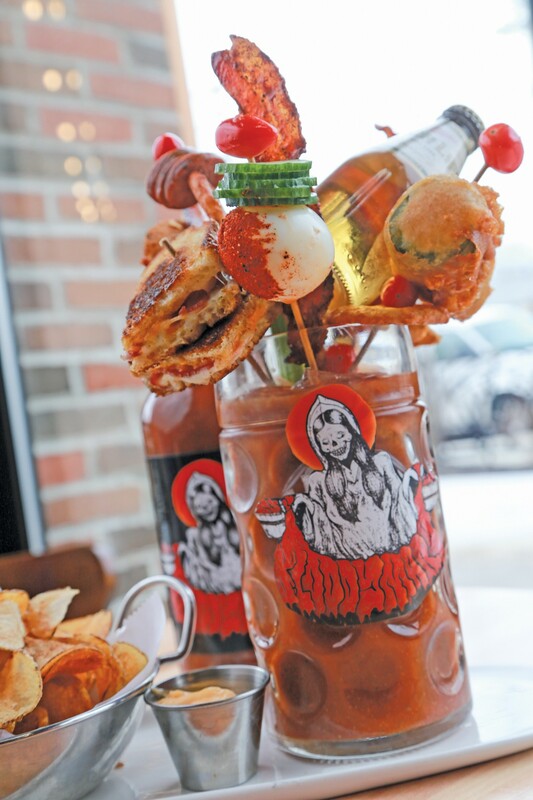 Adega also has one of the best Bloody Mary bars around and, most importantly, starts serving them up at 9 a.m. on Saturdays and Sundays, which is a blessing for everyone who just can’t wait till 11 to get the weekend started right. Desayuno, as they say in Mexico, is the most important meal of the day. As one might expect, the folks at El C give brunch a Latin flair, which is the most delicious flair of all, if you ask us. Taking its name from the cryptozoological wonder that is the “goat sucker,” the Chupacabra cocktail is a blood-red lid lifter made with bacon-infused vodka, spicy tomato juice and a rim dusting of chile-lime salt. You can’t go wrong with the huevos rancheros, but consider taking the blue corn breakfast enchiladas for a spin. Inside the blue corn tortillas is tender ancho chile-braised beef brisket, scrambled eggs, black beans and Chihuahua cheese. Savory, corny griddle cakes are paired with Mexican Coke-glazed bacon, while Las Gachas is a comforting porridge of cheesy grits topped with shredded mole-braised lamb and sunny-side-up eggs. Don’t forget the churros! Have brunch on the river courtesy of Collison Bend, the year-old brewery from Zack Bruell and company. In addition to the regular lengthy menu, diners have a choice of a half-dozen breakfast-themed items to enjoy alongside those watery views. Eggs in Purgatory — eggs poached in a spicy tomato sauce — is showered with feta and accompanied by grilled flatbread for soaking up all that angry gravy. The tantalizing French Toast Bake consists of brioche layers intermingled with sweet cream cheese, berries, Nutella, egg custard and vanilla maple bourbon syrup. A knife-and-fork-style breakfast pizza is weighed down with house-cured bacon, caramelized onions, tomato, mozzarella, cheddar and a sunny egg. A list of boilermakers pairs house brews with compatible shots of booze. Flour’s star of the Sunday brunch — the eggs Benedict — nearly ruins diners for all other versions. Maybe it’s the crisp-edged English muffin, or the thick but supple slice of mortadella; not to be overlooked are the perfectly poached eggs and the creamy, decadent hollandaise. This attractive suburban bistro always manages to fluff our sails, even after a long, rough night. Diners can go simple with a fluffy veggie frittata or whole hog with a sausage pizza. We prefer the breakfast pie, thin, crisp and dotted with spinach, feta, sunny-side-up eggs and sweet and sour peperonata. Cute as a button — and not much larger, to be honest — Lemon Falls is a cheery ray of sunshine in the heart of the Village. From quick-serve pastries like muffins, scones and Russian tea biscuits to full breakfasts, this New England-style gourmet market is as convenient as it is on trend. Pop in on a Saturday morning and enjoy a mug of cappuccino or chai latte and a plate of poached eggs with prosciutto and Parmesan. A fried egg sandwich consists of two eggs, bacon, tomato and gruyere on an airy brioche bun. Before you leave, grab some housemade granola for later in the week. Given that bread and breakfast are closely intertwined, it’s always wise to brunch at a bakery. And when that bakery is the Blue Door Cafe, all the better. Whenever we have plans that take us south of the Turnpike, we begin our travels early enough to stop here for an exceptional meal. Decanters of French-press coffee give way to summery mimosas. Any item that includes house-made English muffins or fresh-baked croissants is a win, as is the Croque Madame, a sandwich-like meal with rosemary-scented ham, gruyere and eggs dripping with lush bechamel. Chicken and waffles gets an upgrade thanks to pepper-brined fried chicken, jalapeno-and-cheddar waffles, bourbon butter and housemade hot sauce.